Our A4 acrylic literature holder does exactly what it says on the tin. 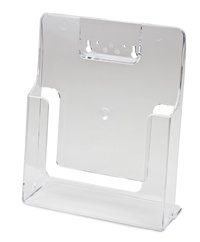 Suitable for mounting or as a free standing display, this holder is perfect to hold portrait A4 brochures, leaflets and flyers for display purposes. Made from clear acrylic and pre-assembled, this display is a perfect addition to any exhibition or retail environment to keep your literature neat and tidy. This is our largest sized literature stand and is perfect for glossy brochures and A4 posters where you want the full design to be seen. 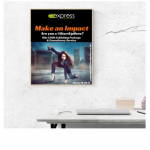 With pre-drilled holes, this acrylic literature display also offers the option of being mounted with ease to walls. Once the display has been securely fastened in place, literature can be added and away you go!